I know the 45 Government is a little tricky to reload as there are at least 3 different levels in this caliber. In the HuntingNut's reloading database it's a little bit confusing. I always tought that the first part was for handguns. But in that list under the title "45-70 load data" you get a lot of data that are mentioned for the Marlin 1895. In the second list you can find under the title "45-70" other data. For several years I own a Ruger #1 in 45-70, but because that's a Lyman Centennial thingy I hesitate to take it to the range or to hunt. Also the optics on that rifle is a reproduction of old optics, so not so well for modern hunting. Last week I got my hands on a Marlin 1895 G with 18,5" ported barrel (thanks to my hunting-girl-friend. She knows I love this old caliber). I put a scope on it and took it to the range on Sunday. so I already put another scope on that rifle, closer to the barrel and I'm reloading several test rounds. I have in stock Sierra's 300 grs HP and a lot of different home made lead pills in the right size from about 300 till 500 grs. Locally we don't have any deer nor elephants, so I want to use it with a lead bullet (+/- 410 grs?) on roebucks. This means that I have to keep velocity low (that's also better for my nose). I already discovered several recepies that might work. But when I started looking for data in the HuntingNut's Reloading Database, things became very confusing. Is there something I don't know and I should know (when I'm allowed to know) when discovering this 2 different lists on the 45-70? Will someone help me out and light things up a little? Did I mention that besides several different makes of blackpowder I also have some Pyrodex RS and even some CTG. I already made some loads with TrailBoss and Vitha's N120. 25,000 c.u.p. maximum pressure...Trapdoor and etc. 50,000 c.u.p. maximum pressure...Ruger #1 or custom Siamese Mauser conversions. Of course any loads from the first group can be used in the other two groups and any of the first two can be used in the third. Aloys, I have a 1868 Rem Rolling Block that I load for in 45-70. I found that there were several smokeless powders that provided similar or higher velocity than Black Powder/alternatives at lower chamber pressure. I used the Hodgdon website and their lowest pressure loads. I tried Varget at first but it left unburned powder in the bore. Its burn rate is too slow. Switched to H4895 and all was good. I chose not to use Trailboss because I got inconsistent results using copper jacketed bullets. I had a buddy tell me it was designed for lead bullets. Met him on the range while he was testing is cowboy action loads with lead bullets and his velocity consistency was great. I did buy some felt filler pads to take up case space when using the smokeless powder. I've been impressed with H4895 light load capability. I've been using in 45-70, 30-06, 308, 300 WM, and 270 Win. I've gone lower than Hodgdon min loads but stuff tissue into the case to keep the powder against the primer. Note, I didn't go below min recommended H4895 loads for the 45-70 though I believe I could with my experience with all the other cartridges. I love trail boss with my cast loads BECAUSE I DONT OWN A CHRONY . they shoot well enough to headshoot sheep at 50 yards..... plenty good enough for this Kiwi. Aloys......find a lead cast mold with big/huge hollowpoint and use that for your wee roe deer...plenty heaps smackdown and no over penertration if you can find right one. think subsonic .22lr on nuclear steroids. Aloys, another guy here to talk to about reduced 45-70 loads is Gelan. He has developed some nice gentle loads for his petite wife to shoot. I do believe his loads are for cast boollits. As I understand: Trailboss is OK for lead bullets at very low velocity (look at the maximum loads). If one needs higher velocity (in lead or jacketed), take powder listed in the middle (= not slow, not fast). 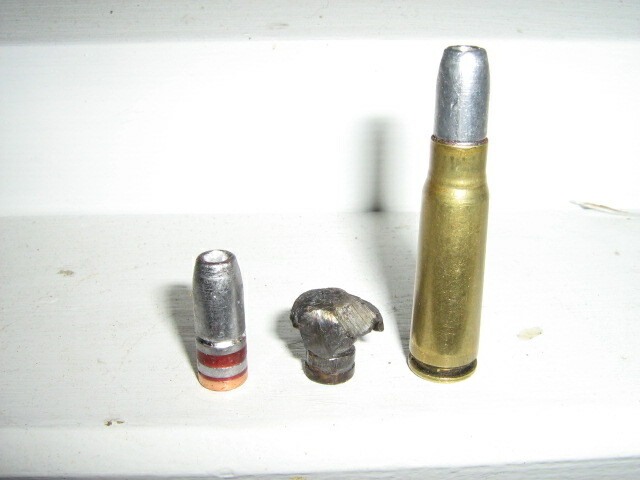 As for hunting: what's the best lead bullet: a harder one with HP or a flat point with softer lead? I'm starting to get good feeling about a soft bullet at low velocity (and measure the distance to the target and know the traject, comparable with shooting an airrifle). And what about the 2 different listings for the 45-70 here on the HuntingNut? Does it make sence? Geland is showing many pictures, but did he ever show a picture of his wife's nose? I've seen Sue's nose mate and trust me when I say it is unmarked and certainly has no scope rings scars. From memory, I think Gelan used a HP cast projectile for hunting (I think there is a picture somewhere in here if a head shot rabbit he got with his 45-70 using a cast load). soft as butter ho ho hollow point ...... the ones I run in my 7.62x39mm penertrate about 6" at most...eg they dont exit skulls. 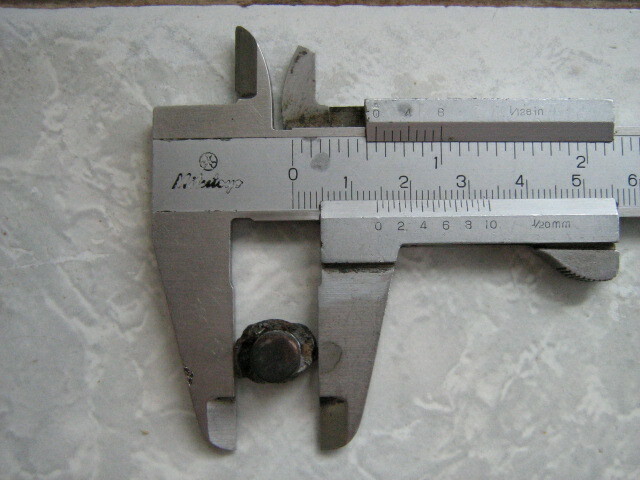 the single projectile we have recovered measures 14mm so thats twice as fat as the start diametre. super soft will also lower chance of it bouncing off a hard surface. A flat point should be sufficient - hit them like a hammer! Is there a leading concern with too soft a bullet? I use cast bullets from Oregon Trail for my 45-70. It's a kind of survival thing: when you have your guns you should also take care that you can feed them. 400 grain cast bullets (mine came from Valiant) over 27.0 grains of Accurate 5744. Shoots 1.5" groups at 100 yards from both my Marlins.